Tripura is a beautiful state located in the northeastern part of India. This state has a rich cultural heritage and has managed to preserve its traditions and culture even in the present age of technology and advanced science. The state is home to about 19 tribes among which the Kokborok speaking Tripuri people are the major tribe and the Bengali population forms the ethno-linguistic majority. The cuisine of Tripura is rich in variety and carries a distinct taste.The food culture of Tripura is primarily non-vegetarian in nature, though a minority of the people is Vaishnavite and follows strict vegetarian diet. Meat is a prominent part of this cuisine, which is prepared in the traditional way. Other dishes make use of vegetables as well as fish.The Tripuri cuisine is known as Mui Borok in the traditional language. One of the key elements of the Tripuri cuisine is a dish called Berma. It is a dried and fermented fish prepared without oil and flavored with local spices. This dish has a taste bordering on the sour side. Rice form the basis of food for the people of Tripura. The dominance of rice on the food culture,you can see the existence of rice in every aspect of the cuisine.The cuisine of Tripura uses a number of spices to render the dishes a delicious taste. Among the spices the most commonly used ones are mustard seeds, paanch phoron (a blend of 5 spices used to temper the dishes and comprising of onion seeds, white cumin seeds, fenugreek seeds, fennel seeds and mustard seeds), green and red chillies, turmeric.. The state produces a lot of green vegetables which are used by the people. Commonly found vegetables of the Tripuri cuisine are eggplants, chillies, pumpkins, bamboo shoots and corn. As like other Northeastern states, this cuisine also goes for fermented foods,local herbs, delectable meat dishes and bamboo shoot. I chosed to cook this Kosoi bwtwi which is a popular food of Tripuri cuisine as vegan and skipped the Berma fish used usually in this dish. 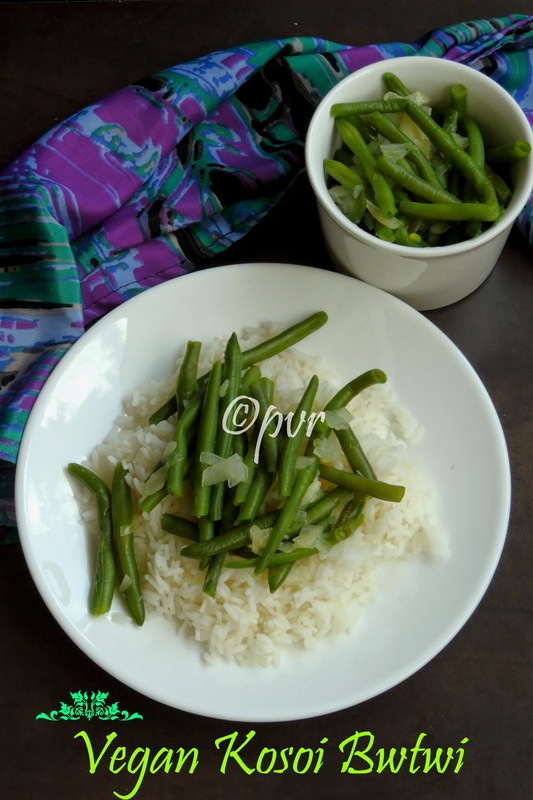 This dish tastes good with rice with a mild garlic flavour,this dish was almost like steamed french beans which we usually have for our dinner with breads. Clean the beans and chop as medium pieces, slit open the chillies, cut the onion and crush the garlic cloves. Boil enough water,add the turmeric powder, slit opened green chillies. Add the beans,onions and cook in medium flame until the veggies gets cooked. Bring down to simmer, add the crushed garlic and cover with lid. Put off the stove, serve with rice. Traditionally khundrupui a local leaves are added in this dish, since its difficult to find, i skipped it along with Berma fish. yes they do look like boiled beans..but the garlic would surely enhance it..the greens on top of a rice bed!...makes a beautiful picture. that is simple and so easy!!! nicely done Priya!! Healthy, nutritious and simple recipe with subtle flavors. I also love the state-wise descriptions that you give us. Simple healthy dish on the rice bed. Lovely. A fuss free and delicious side dish! What a simple dish! Most such dishes enhance the flavor of the main ingredient. I am sure it tasted great. Such a simple and healthy side dish. Same pinch Priya. But I added sauteed tofu to this simple everyday kind of a dish! You have managed to make it look so inviting Priya..very nicely done..
Sampe pinch, I made the same dish and absolutely loved it for its simplicity. Beautifully presented! And this is a healthy dish! Even I made this but your looks more edible. I left the water as it is and mine was more like a broth. i like your version. wow thats an simple and delicious vega version of kosoi :) looks fantastic in top of rice aks , they might look like boiled beans but they are so healthy and flavored can guess it :) another fantastic recipe choice for the state !! Unlike the other regions of India, these NE regions do keep their dishes simple. Isn't it?